That's a wrap! M. Night Shyamalan has worked his way back into people's good favor, mostly because of Split, which is one of the most successful movies of 2017. What people didn't know heading in is that the movie was actually a sequel to Unbreakable. Given the success, the director quickly got to work on Glass, which will conclude the Unbreakable trilogy. Now, thanks to some of the cast, we can confirm that the movie has officially wrapped production. Toward the end of November, M. Night Shyamalan took to Twitter, announcing that he was heading into the last week of production, saying, "Spent last two days in the editing room deciding what shots I need to get or redo in the last week on #Glass." Anya Taylor-Joy, who reprises he role as Casey in Glass, took to Instagram to confirm that those final shots are in the can and that Split 2/Unbreakable 2 is one step closer to arriving in theaters. Here's what she had to say about it. "Buh bye Casey Bear! Two years ago, I secretly paraded around 30th street station in a giant bear costume to prank Mcavoy and the crew. It was the last day of filming and I'll remember it forever. Having just wrapped Glass, I am filled with so much gratitude and love. The memories we've made on these two movies are beautiful and sacred and I am a lucky girl indeed to have shared them with all of you. 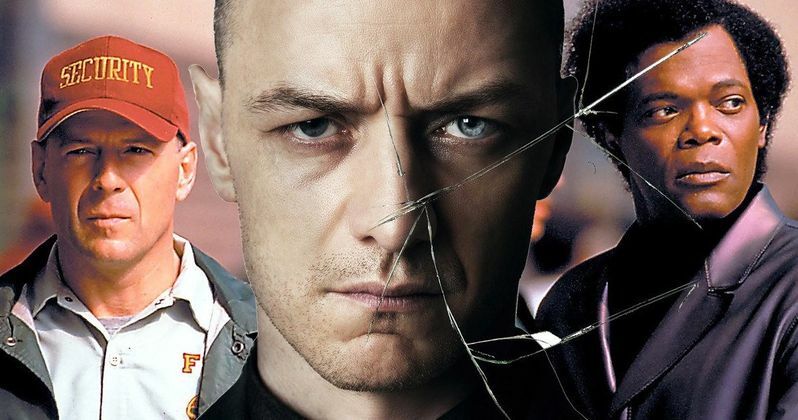 Beaming with pride, joy+ affection"
Glass picks up following the conclusion of Split and finds David Dunn (Bruce Willis) pursuing Kevin Wendell Crumb (James McAvoy), aka The Beast, in a series of encounters that begin to escalate. All the while, the shadowy presence of Elijah Price (Samuel L. Jackson), aka Mr. Glass, emerges as an orchestrator who holds secrets critical to both men. Here's what James McAvoy had to say in his Instagram post, confirming that production on the highly-anticipated sequel has wrapped. "Had an amazing time last night at @surayaphilly where we had our wrap party for #glassmovie . The food was AWESOME and the staff (pictured) where fantastic!!! They've cherry picked some of the best people from around Philly to run this place and it's rockin!" Split grossed a very impressive $278.3 million worldwide, working from a production budget of just $9 million. Perhaps more importantly, at least for Shyamalan's career, the movie was very well-liked by critics and fans alike. So, we're finally going to see the return of David Dunn and Mr. Glass. Unfortunately, even though production has wrapped, the release date for Glass isn't until January 18, 2019. So we still have more than a year to wait. You can check out Anya Taylor Joy and James McAvoy's social media posts for yourself below. Spent last two days in the editing room deciding what shots I need to get or redo in the last week on #Glass.